DANIA BEACH, Fla. /Florida Newswire/ — The Fourth Annual Dania Beach Arts and Seafood Celebration 2016 has raised the bar for entertainment, boasting an electrifying performance line-up featuring it’s first-ever Grammy Award-Wining National Headliner, provided by the Casino at Dania Beach: Survivor. The celebration will take place on Saturday and Sunday, April 2 and 3, 2016 from 11 a.m. to 8 p.m. on Saturday and 11 a.m. to 7 p.m. on Sunday in Frost Park, located at 300 NE 2nd Street in Dania Beach. “We are beyond thrilled to announce Survivor as the National Headliner for this year’s celebration! In booking such tremendous artists to perform in a fun, energetic outdoor space, this venue and celebration grounds effectively adds yet another dimension to what Dania Beach can offer to residents and visitors alike,” said Rachel Bach, Executive Director for the Dania Beach Community Redevelopment Agency. This year has an incredible entertainment line-up. 11:00-12 – Whipping Post (Blues). 12:30-1:30 – Speakerbox (R&B, Pop, Dance). 2:00-3:00 – High Tolerance (Latin). 3:30-4:30 – Ragdoll (Frankie Valli & Four Seasons Tribute). 5:00-6:00 – Mr. Nice Guy (Classic Rock). 6:30-8:00 – National Act (Survivor). 11:-12:30 – Nikki Kidd (Jazz). 1:00-2:00 – Casey Raines (Country). 2:30-3:30 – Making Faces (Pop and Reggae). 4:00-5:00 – Good Vibrations (Beach Boys Tribute Band). 5:30-7:00 – Lazy Bonez (The Amazing 80’s Rock Show Tribute). In addition to live entertainment, this free event is filled with beautiful art, delicious seafood, over 100 unique vendors and exciting interactive creative experiences. 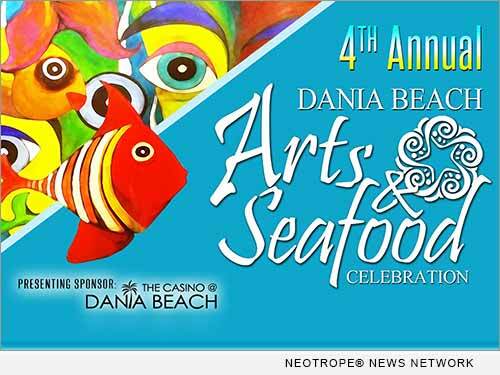 Plan to stay for the day – bring lawn chairs and blankets, relax, dance, sing and enjoy the live entertainment and food at your leisure at the Fourth Annual Dania Beach Arts and Seafood Celebration! For more information please visit http://daniabeachartsandseafoodcelebration.com/ and follow us on Facebook at http://www.fb.com/DaniaBeachArtsandSeafoodCelebration. Copyright © 2016 FloridaNewswire™ and Neotrope®. Florida Newswire is a publication of the Neotrope News Network and a TM of Neotrope. Christopher Laird Simmons is the founder and CEO of Neotrope® which is involved in entertainment and technology publishing and other media. He is a current member of the Public Relations Society of America (PRSA), and the American Society of Composers, Authors and Publishers (ASCAP). He has written for a wide variety of national and regional print publications since 1984.